The planning stages of this trip to ride the Trans Labrador Highway (TLH) had started about 10 months prior to leaving but did not involve me at all. Back then I was in the process of planning my own trip from Alaska then to Tierra Del Feugo. However, those plans had to be delayed. Being totally bummed about not having that adventure, Jeff and Joe, two guys that I had met the previous winter said ” Why not join us to do the TLH”. I was super keen for a true adventure but knew next to nothing about the TLH and the true nature of that road. 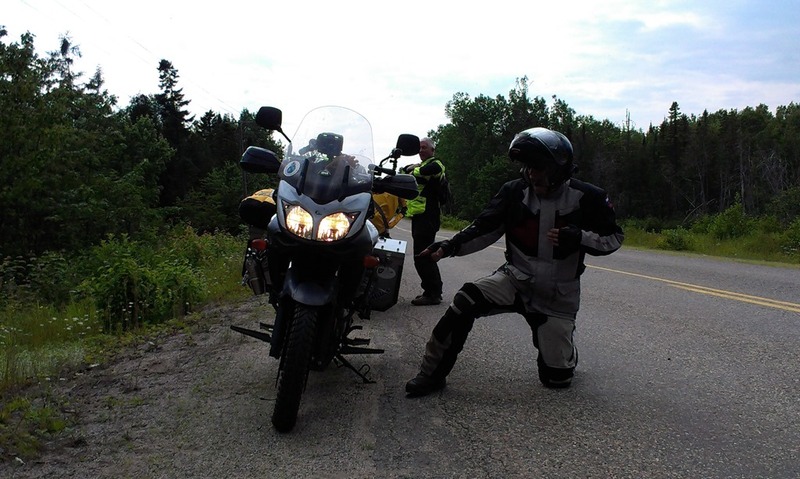 I wanted an adventure and I got one, don’t forget in my previous post “120 kmph and hitting loose grade B gravel…….. “So I readily accepted the invite and since all the planning had pretty much been done all I had to do was twist the throttle and follow. The trip began on July 4th. It was a perfect day for riding. We met in Lancaster close to the Ontario and Quebec border. Jeff was driving his Super Tenere 1200 that had seen the Pan America highway the year previous. Joe was on his V-Strom 1000 and I was my V-Strom 650. Our plan for that day was pretty uneventful. Jump on the super slab and make a 575 km B-Line to Claude and Annies for our first night. However, the best laid plans never really go that way. Seems our brave and courageous leader forgot to update his GPS and had not taken into account a new highway built in Quebec and was one U-Turn after an other. Truth be told a U-Turn is really only an inconvenience when you have to be somewhere fast. Neither of those applied to any part of this trip so we had a few good chuckles and dubbed it the U-Turn Adventure. Upon arriving at our first stop, our hosts were awesome. Claude and Annie, other adventure riders, fed us like kings, and gave us a great tour of tracks they were building on the properties for off road trials riding. The next morning we headed off in the rain. However, we were ready for it. So we thought! The rain cleared up around noon just before we entered into New Brunswick. We rode most of the afternoon in glorious riding weather. 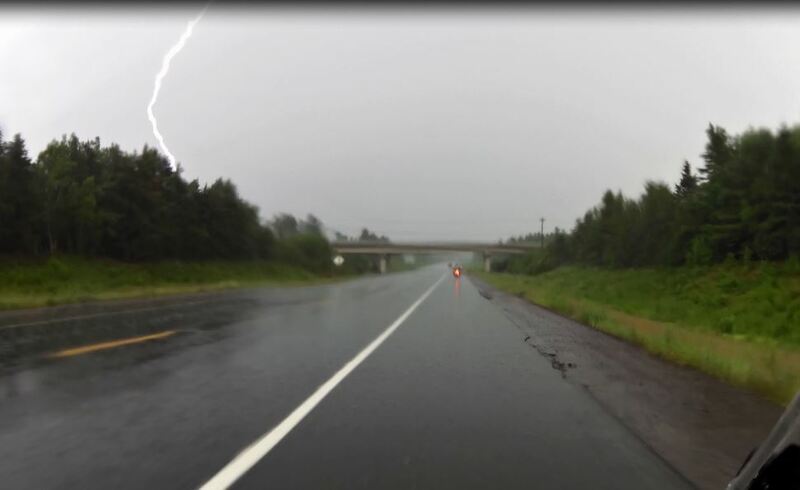 We cut across NB on the 132, a delightfully rough ride, where our bikes, well at least mine, had the opportunity to ” shake off” some of the cheap E-Bay equipment I had installed on her. Giving her the nickname ” Harlie”, since things just kept falling off. A lightning strike. Jeff’s taillight can be seen just up ahead as he heads for a bridge. It was probably mid afternoon when that ” rain” thing showed up again. We were troopers, We pushed through it. It started coming down harder, but we pushed on, it came even harder and we pushed through and even when the other cars were pulling off the road and the rain was washing mud across the roads from the hills and it was blowing sideways we pushed on, but at a very slow speed.. We eventually did pull over under a bridge when the lightning moved in, but only for a few minutes. We made it to our stop for the evening in Shediac NB. By this time the rains had pretty much let up. We had made plans to stay at another adventure riders place but he was no where to be found. Still being fairly wet we opted for a motel instead of a tent for the night. It was a good night for pizza. 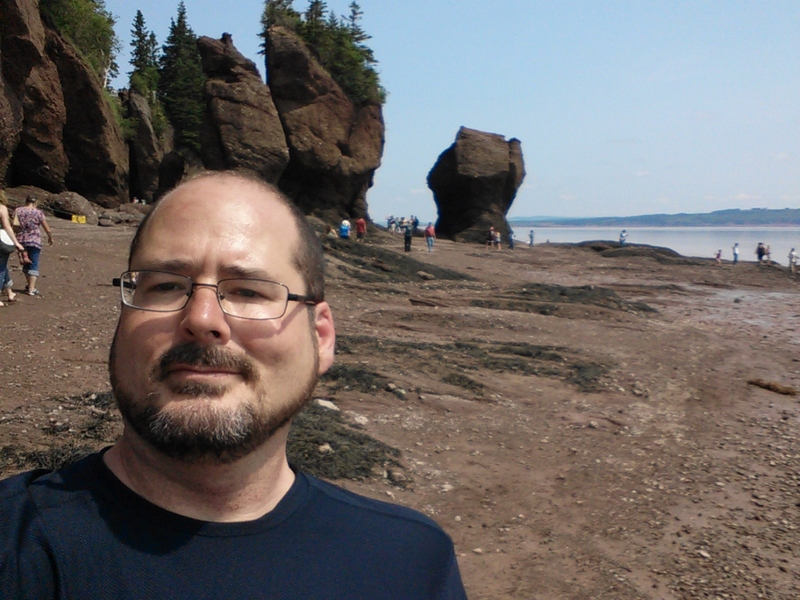 There goes my diet for this trip..
Refreshed and dried out by the next morning we made it out on a beautiful morning and headed to Hopewell Rocks at the Bay of Fundy. We were pleased to find that the Motor Maids, a very large all female motorcycle club was having its 75th anniversary rally there. We had a great time meeting groups of them from all over the US and Canada. 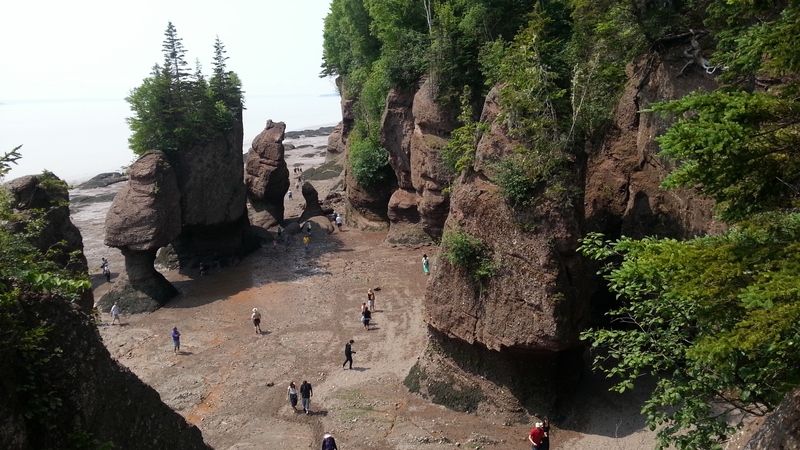 Hopewell Rocks were absolutely stunning. The tides rise and fall up to 56 feet twice a day. With thousands of years of erosion these tides have left behind some spectacular sculptures in the rocks. 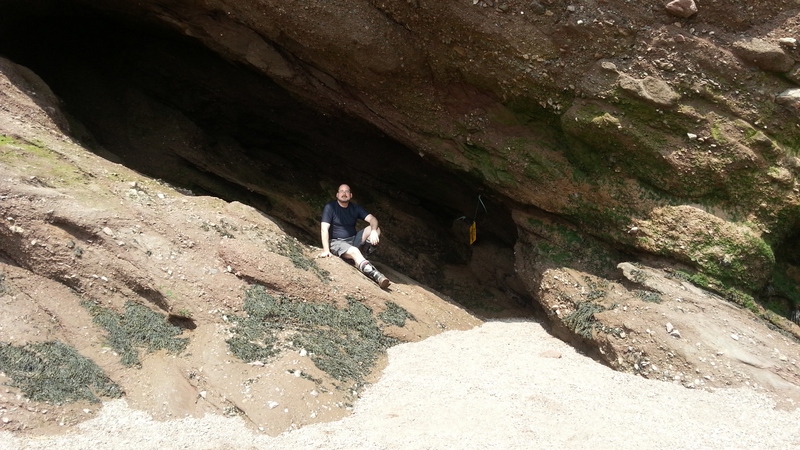 We made it at low tide so spent a few hours roaming down at the bottom of the cliffs. The climb proved to be a bit of a challenge at times, as both Joe and I have bum legs/ ankles, but it was well worth all the climbing. 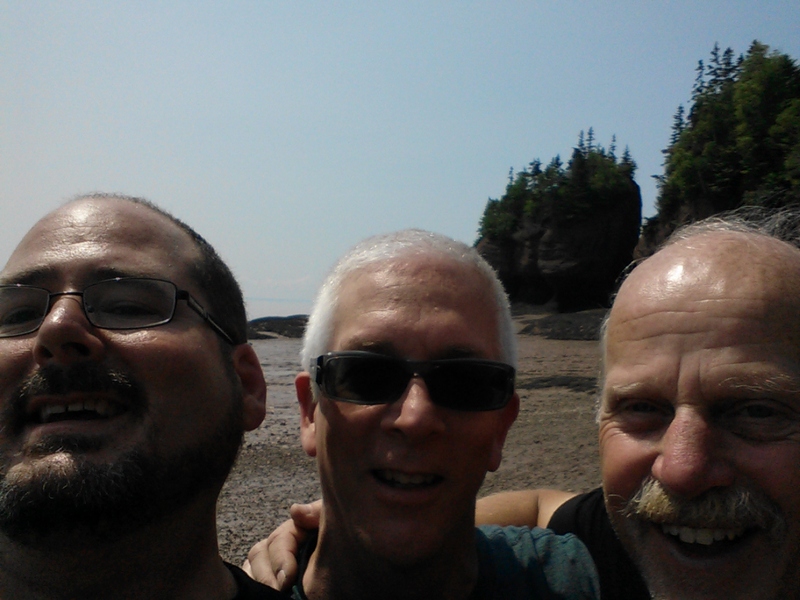 After a few hours of taking in the scenery we decided at the last minute to head to Prince Edward Island. A favorite spot of mine. Even though I have been there 11 times I never tire of it. So the guys gave me the lead for rest of the day and we headed to North Rustico, a small little fishing village on the northern tip of the Island. We ended up getting a little cottage nestled by the oceans shore. It came fully equipped with a kitchen and BBQ. So after unpacking we headed into town to buy some steaks. Nothing like a BBQ’d steak dinner by the ocean and to finish it off we headed down to the shores for a bonfire. Even though we were all exhausted from a day full of riding along coastlines with spectacular vista’s, and even trying to find some ” mud” for a little off roading, which didn’t pan out, but did find some sand, we all had some great laughs by the fire that night. The morning started off with spectacular weather. Sunny with just a small chill in the air blowing in off the Ocean. Perfect weather for riding. The plan was to head to the bottom tip of the Island to catch a ferry to Nova Scotia, were we were going to meet another group of riders from the Ottawa area. Turned out they had the same plan as us the previous day and we met on the Ferry that morning. There is something that strikes a cord inside of me that put’s me a a zen state of mind when I am close to the Ocean and even more so when I am on it. I call them my ” Zen moments” I sense and feel I am ” home” and more “alive” than any other time. Something about the depth of the water, the mystery that it holds, the sounds, the smells, just about everything in fact. However, this ferry ride was about to hold a even deeper surprise for me, one that I have never had the opportunity of experiencing before. Something that I held close for the rest of the ride and probably rest of my life. In my next post I will explain that ” moment”. Still to come. 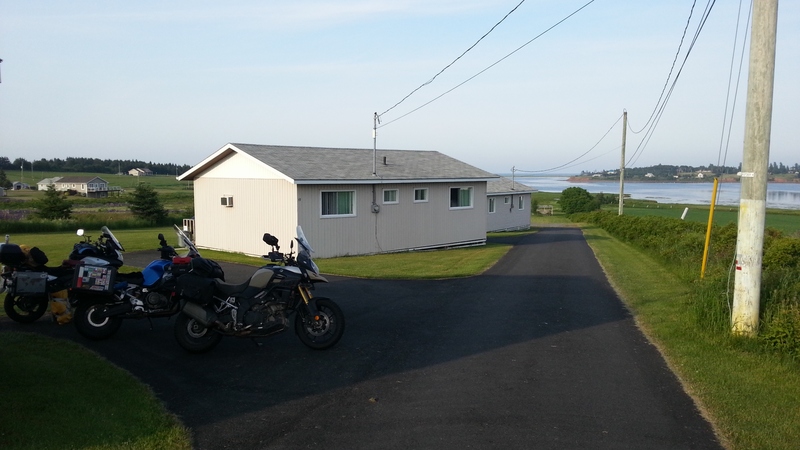 A ” moosely encounter of another kind”,scraping pegs on the Cabot Trail, and taking full air on a V Strom 650, I just proved to myself it could be done.